Lead counsel in the successful reorganization of the nation's largest chain of Christian bookstores, with over 260 retail locations and annual revenues in excess of $200 million. Represented the 363 stalking horse bidder and purchaser in the acquisition of substantially all of the assets of an international manufacturer of high quality fasteners and tack buttons. Represented secured lender in participation negotiations and workout involving over $5M of debt secured by residential townhome units and raw land. Represented secured lender with a claim in excess of $10M in a Chapter 7 case involving a Ponzi scheme with over $100M of alleged fraud claims. Represented secured lender in loan workout and civil RICO litigation involving real estate loans in excess of $15M to an operator of truck plazas and service stations in south Georgia. Represented secured lender in loan workout and restructuring of credit facilities in excess of $35M to a Southeastern multifamily and residential subdivision developer and property manager. Represented secured lender in the loan workout, restructuring, and subsequent litigation involving in excess of $29M in related real estate loans to a Southeastern residential subdivision developer. Represented secured lender in the loan workout and restructuring of approximately $40M in related real estate loans to a Southeastern residential subdivision developer. Represented secured lender in loan workout, restructuring, and subsequent Chapter 11 case involving three loans in excess of $19M secured by assisted living facilities in the Southeast. Represented secured creditor in a Chapter 11 case involving loans in excess of $12M to a Southeastern residential subdivision and townhome developer. Represented secured creditor in a Chapter 7 case involving the recovery and subsequent sale and disposition of helicopter collateral worth approximately $1.5M. Represented the 363 sale purchaser in the acquisition of substantially all of the assets of a manufacturer of file folders, envelope, and related paper products. Represented secured creditor in loan workout and subsequent liquidation of a specialty construction business with loans in excess of $10M. Represented the secured lender in the successful reorganization of Chapter 11 case of an OEM automotive supplier. Represented lead bank in the workout, restructuring, and subsequent litigation involving loan participations exceeding $50M to regional community banks. Represented secured lender in the loan workout and restructuring of loans in excess of $15M to the manufacturer of luxury yachts. Represented the secured lender in the foreclosure and subsequent litigation of multi-million dollar loans to a transportation logistics company. Represented secured lender in a lien priority dispute with a general contractor involving a loan in excess of $20M. Representation of national and regional banks in multiple foreclosures sales, confirmation actions, and receivership actions. Represented secured lender in a loan workout and collateral disposition involving over $5M of debt secured by the leasing portfolio assets of a distressed finance company. 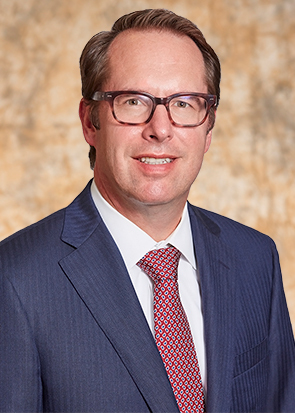 Erich serves as the firm's President and Strategy Partner collaborating with each of the firm's practice group leaders to enhance practice management. In addition, he serves as the Atlanta Office Managing Partner while practicing in the firm's Creditors' Rights and Bankruptcy Practice Group assisting companies, banks and other financial institutions in a variety of bankruptcy matters. Erich services clients in the resolution of complex commercial issues, the restructuring of performing and distressed credit facilities and swap agreements, and the maximization of debt and collateral recovery. Erich has extensive experience in the representation of companies, secured lenders and other financial institutions in debt restructurings, workouts and forbearance agreements; the negotiation and closing of commercial loans; the prosecution of receivership and other judicial actions to protect, preserve, and recover collateral; and Chapter 11 bankruptcy cases. Erich also routinely represents the purchasers of assets in Chapter 11 case in all phases of the transaction from the securing of stalking horse bid protections to the negotiation and closing of the asset sale transaction. Erich is also a member of the Firm’s Blockchain, Cryptocurrency, and Electronic Transactions Group. He advises secured lenders, financial institutions, and other businesses in these areas, with a focus on the structuring, interpretation, and enforcement of electronic contracts, smart contracts and related digital assets and rights. Burr Alert: Dead Letter Office: The Final Repose of the Georgia Confirmation Statute?